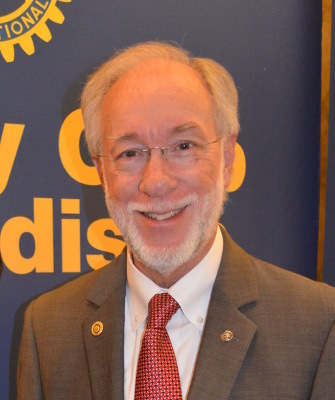 Rotarians got to know our 2015-16 President, Ellsworth Brown, better this week, when he pledged transparency, revealed his personal story and his goals for his Rotary leadership year. If you love history, you may know him professionally. Director of the Wisconsin Historical Society for 11 years, he is the former President and CEO, and trustee of Carnegie Library of Pittsburgh and also of Carnegie Museums of Pittsburgh. Prior to this, he was director of the Chicago Historical Society. Brown was president of the American Association of Museums from 1990 to 1992, and is a director of the Smithsonian Institution’s National Museum of American History. If you love Rotary, you’ll be glad to hear his goals for this year include designing a major international outreach project with financial support from various sources including Rotary International, as well as instituting a high impact project centered on “building a strong, diverse but united and sustainable Madison community.” This second project will include viewing our activities through a racial lens and supporting specific job training and career pathing actions. With 44 committees, fellowship groups and events throughout the year, steering the club is a major work effort for the President. Brown told the group he appreciates the depth of the membership, what each member offers Rotary, and how they connect the club to the community. “You work hard to say yes,” he said. Telling about his work, Brown shared more about the Wisconsin Historical Society. The society has a dozen historical sites around the state. They are the official state archives and 60% state funded. They hold four million photographs and three million texts in 38 linear miles of shelving among 12 library/archive sites. “We aim to be useful” is their simple motto. They hold Daniel Boone’s papers, the student non-violent coordinating committee materials, and colonial newspapers, among many other treasures. “We have museum to help ensure we live in a civil society,” Brown said. Dorothy, his wife of 50 years and whom he met on his first day of first grade, was at the luncheon. They live in Fitchburg.